Thanks to a farmer in the Cyprus village of Akaki, about 14 miles from the capital Nicosia, archeologists know a lot more about the island’s history and horse races in ancient Rome. The farmer uncovered a 36-foot by 14-foot mosaic floor piece that researchers believe dates back to the A.D. 4th century, and likely came from the villa of a rich country man. The mosaic shows four chariots with their charioteers and horses, likely a depiction of the horse races in the Roman hippodrome, an open-air stadium for horse racing. There are also inscriptions near the charioteers, which the archeologists working on the site believe could be their names. 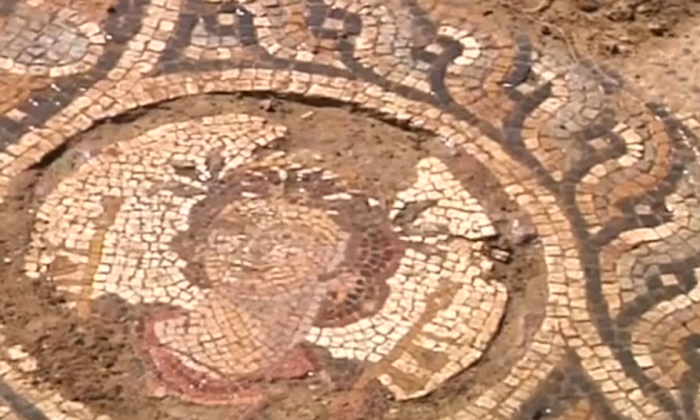 Dr. Fryni Hadjichristofi, the chief archaeological officer in charge of the site, said there are only nine other mosaics that depict this theme in the Roman world. “I was really glad [to find this] because I know how quite rare this theme is, and to find this subject in Akaki, in an area where we don’t know anything else, it was surprising,” she said. The mosaic was found under a trail that at one point had a railway over it before the railway was dismantled in 1951. Over the years, the foundation of the railway may have protected the mosaic. The area is better known for its vegetables than for its archeological finds, and provides archaeologists with more insight into the history of Cyprus’s interior. Hadjichristofi told the AP that a piece of tile from the site was first discovered in 1938, but because of other priorities in the antiquities department, excavation of the site only recently began. She estimates it will take several more years to fully excavate the site.